The Friedlieb is a beer Chas has been working on for a while. Back in the middle of 2015 he made the fourth version of this beer. No write up on the brew day, but I can say that the changes to the recipe were more of a slight alteration rather than any significant. Before starting the review, I need to admit I had this beer for about eight months. Got it in June 2015. Drank it in February 2016. The flavours had settled down a fair bit and the forward hops softened to almost nothing. Now that’s out of the way, onto the review. This is a big coffee porter. It comes in at 10.2%, the strongest version of this beer yet. You can see from the photo it’s very dark. You can’t quite see that it’s not very cloudy. There’s a smooth coffee aroma. Has a push of smoke towards the end and slight very soft rounded yeast aroma. The beer starts with plenty of smoothness. Dark malt from start to end. Smoke and coffee giving this lots of complex flavours that keep it lively and interesting. The yeast flavours are present the whole way from the middle. This yeast is a bit Belgian in style, rounded and with some slight tropical fruit to it. There’s heaps of flavour here and character. Body is good with only a tiny bite from the alcohol. For food matching this would go well with big winter food. Think mixed flavour stew. Or rich tasty sausages. Or super slow cooked red meat, lamb or beef. Anything hearty and deep flavours with pleanty of protein would work a treat. This beer has heaps of flavour, but not a big thick body. So you need something to eat with this, or you get overwhelmed by the end. Really good beer, with a slight tweak this would be a great beer. Chas has been working on this recepie for a good few years. I’m hoping he’ll return to this and brew another batch. Would be more than happy to help give a hand in the quality testing of the final product. 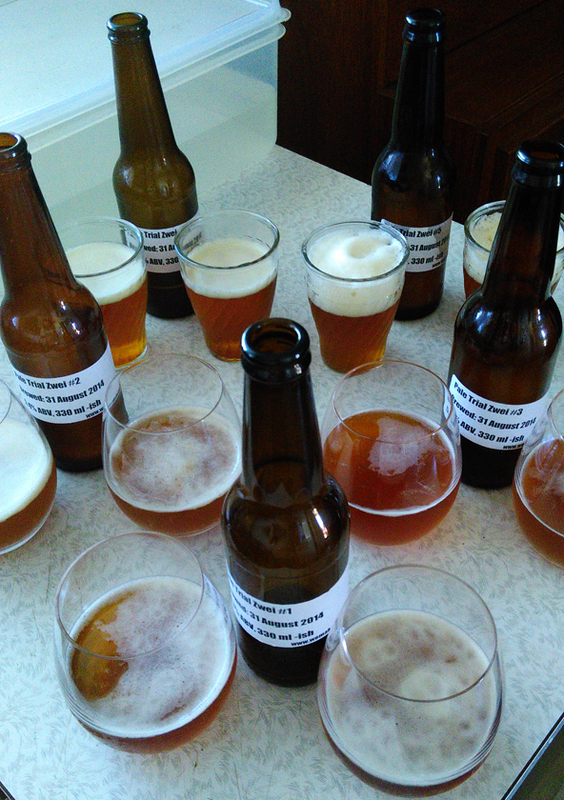 Back in late July last year I went around to Chas’s place and helped with an all Grain pale ale. Chas is now focused of his site Brew In Review and I wanted to do a write up. I’ve finally done it, here we are. Chas had done a few brews back around middle of 2015. You might remember I mentioned he gave me a bottle of The Friedlieb IV back in June 2015. Review of that is in draft and I’ll get up soon. Then there was an all grain pale ale. That turned out too strong. 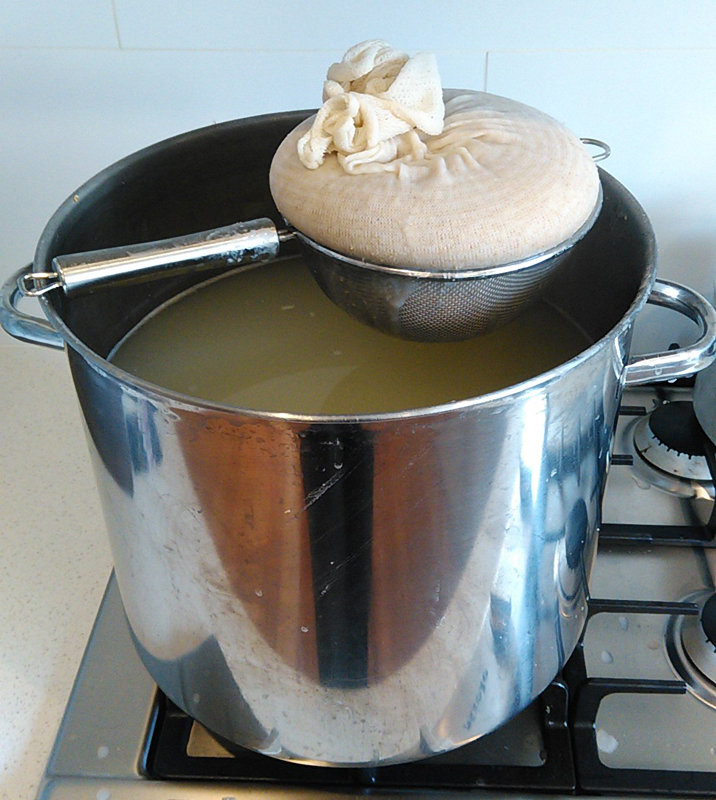 The next brew day, 25 July 2015, was about redoing the all grain with less fermentables. The equipment used was from one of Chas’s mates, a big esky/cooler box converted into a mash tun. Nice and easy to use. Didn’t get a photo on the day, but here’s a pic of it from another day after it got cleaned out. 4 kg traditional ale malt + 40 g malted wheat + 40 g dingman’s biscuit malt + 20 g rye. 16 g chinook + 8 g fuggles for 1 hour. 16 g Citra + 8 g Willamette for 2 minutes. Mash was an hour, target of 67.5°C and landed pretty much there. That was easy. Next was the sparging. Drain the liquid and some hot water poured over the top of the grain. That took ages, about an hour or more. Finally pressed the grain to get extra liquid out. Next up, bring to a boil and keep going for an hour. Three hop additions: 60 minutes, 20 mind and 2 mins. 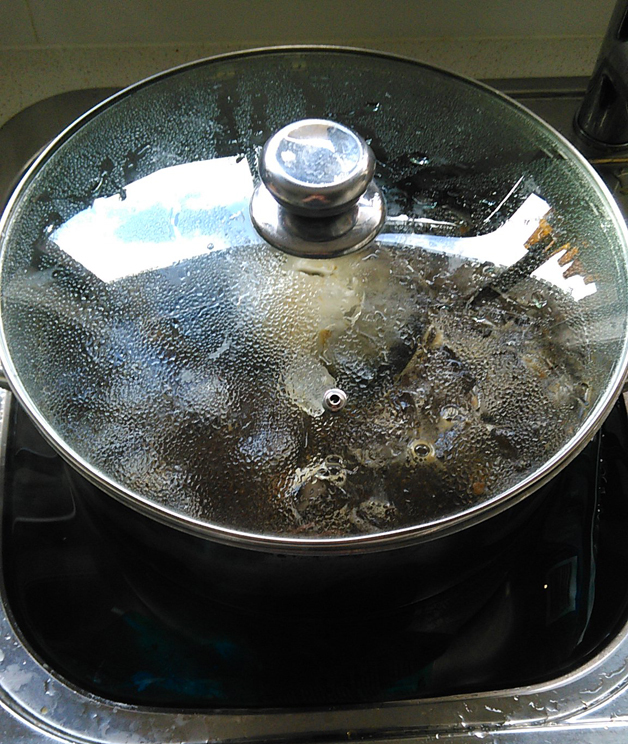 Next, the pot moved to ice bath. Then drain and fill bath a few times. Maybe 40 minutes or so to bring down to low 20’s. Finally into the fermenter and dry yeast pitched straight in. Gravity sample came in at 1.045 which was in the range Chas was after. It was a long day. Chas started the mash about 10:30 before I arrived and we finished up around 3:30. That’s a long brew day and a one of the reasons I still haven’t moved to all grain brewing. Fast forward two weeks to bottling day. Woo! 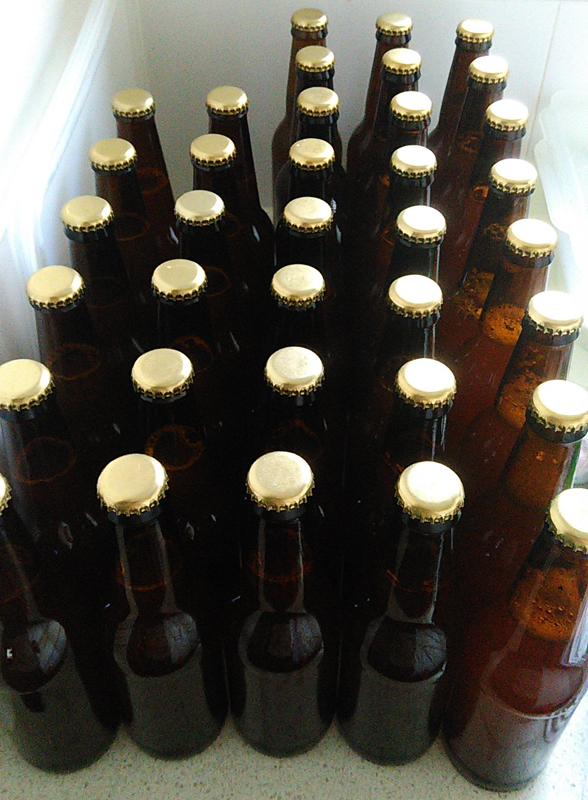 This was a real easy bottling session. Chas bulk primed the beer in the fermenter before I got there and the whole lot was bottled in about 15 minuets. The final gravity reading came in at 1.006 and will be a 5.5% beer after bottle conditioning. The sample tastes great. Plenty of body and citrus hop flavour. Chas gave me a four pack to take home. The test batch seamed promising and I was really looking forward to seeing how these turn out. This beer has been reviewed and I’ll get a post up in the next couple weeks. Worth noting, this recipe was an early version of what became the Priestly Pale Ale. You can read up all about that recipe on Chas’s site Brew In Review. It’s been a long time between drinks. Or in this case, posts. Just over a year! Would like to give a long winded excuse/story, but the short of it is that I’ve not given it much time and haven’t brewed much. Until a few months ago. I’ll keep this short, but there’s stuff coming. Plenty to tell about the Oatmeal Stout, and already done a re-brew. Did a really interesting dual brew with water. Had another go at the Milk Porter. Made a brown ale. Some cider experiments. And the start of attempts to make a “house ale”. Yep, after more than a couple years brewing I’m finally having a go at a recipe for a pale ale that (1) everyone in the house is happy to drink and (2) can be reproduced over and over. Plus, have a few beers from Chas that I need to review. Then these are all the things in the pipeline. Some IPA fun, a bunch of cider (and reason why) and hopefully get around to another attempt at not-beers. We’ll wait and see. Until then take care and enjoy a home brew. Don’t you hate it when you take a sample of your wort and it starts fermenting before you get a reading? No? Just me? This very odd scenario came about last last week due to a series of events. It all started with an idea to make an oatmeal stout. I’ve been thinking about this style for a while. Did a bit of research online and wasn’t impressed with the information on how to make an extract only oatmeal stout. The advice was either: “you have to include (two-row or six-row) malted grain and do a mash” or “you have to steep with specialty grains”. In short, you need to have with grains. The reasons appeared contradictory. Some saying “you need to convert the starch” and others saying “you need to keep the sweet starch flavour”. After plenty more reading I think it comes down to the moth feeling you want from the beer. Mash if you want a smooth oily feeling. Steep if you want thick body feeling. That’s fine, but doesn’t really answer the question for me. 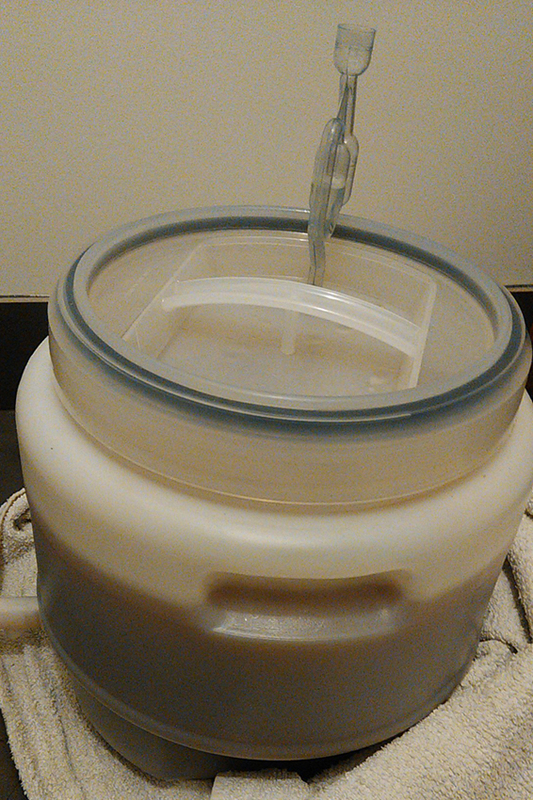 I want to know if it’s possible to skip the grain steeping altogether. Enter my recipe Oatmeal Stout #1. Start with 500 grams of quick/breakfast oats. 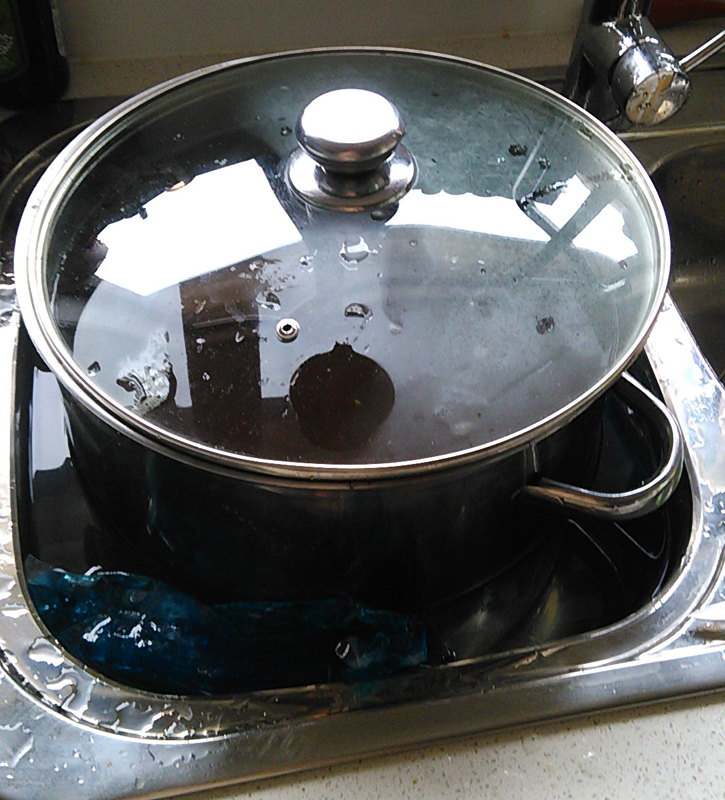 Put into a pot and 1.5 litres of water, or more. Put on heat and bring up but not too a boil. I elected for 65°C. Leave for about an hour. I found that there wasn’t enough water and the pot was too small. It ended up overflowing. I transferred the oats into a grain bag. Then bag and liquid into a much bigger pot. Pot had an extra two litres of water added. Interestingly the starch kept settling to the bottom. So it was important to keep stirring if the heat was on. I had to leave it at this point and return the next day. And I left the bag stay in pot and cooled overnight. Next day was about sparging the oats and washing out as much starch out as possible. Grain bag rested on a sieve and I poured water over semi regularly. This took a fair bit longer than expected, so was left overnight. Next day was finally time for boil. Started at about 11 litres. 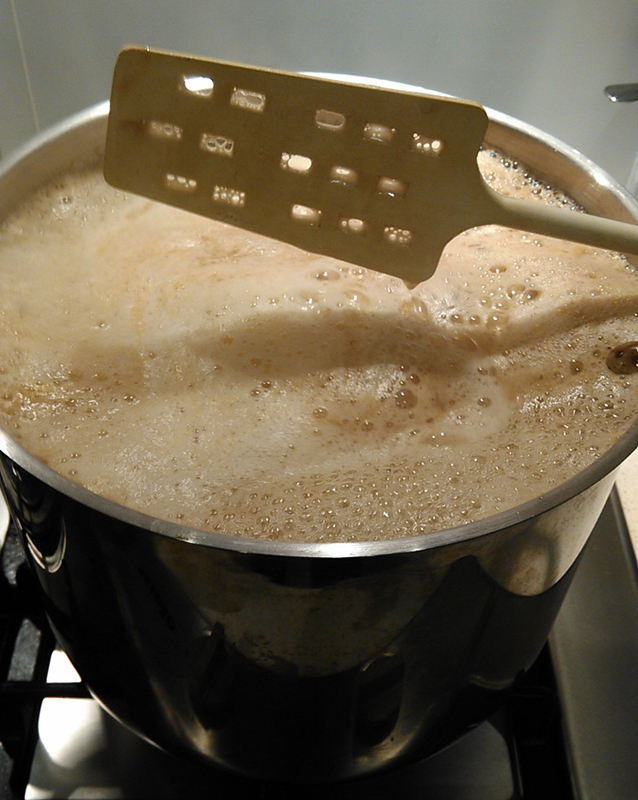 First 1.5 kilograms of liquid dark malt was added and heat slowly brought up to a boil. From there was straight forward sixty minute boil. Warrior hops at the start. Rest of liquid malt and sugar with ten minutes to go. And Fuggles hops at flame out. Sugar addition was to help push up alcohol content. I believe a stout should be strong, and over 6%. Plus the “dryness” from sugar should work well against the thick oat starch feeling. While the wort from the stout was chilling it was time to bottle the Milk Porter #1. That was a big effort. 15 litres were racked off for bulk priming, then into 45 stubbies. The remaining 3 litres were bottled into long necks with a very special twist. Each of the four bottles were primed, one shot of coffee each AND a 2 cm cut from a dried vanilla bean. These four bottles will be conditioned for a minimum of two months. Really excited about these. The final gravity of the Milk Porter #1 came in at 1.030 which was a bit higher than I hoped. After bulk priming this will end up at 4.2% alcohol. Not bad, but a bit short of the high 4’s I was hoping for. That said, the sample I tasted had plenty of promise. While the long neck bottles will be a few months away, the stubbies should be ready by mid/late July. The wort from the stout took a while to chill. Over an hour even with a big chunk of ice direct into it to cool down. Then finally was ready to pour into the fermenter that had the Milk Porter, and the yeast left behind. A good shake up and done. All that was left was to get a gravity sample. This came out with a bit of froth. I left it for a bit to settle down. Then had to leave before it was clear. 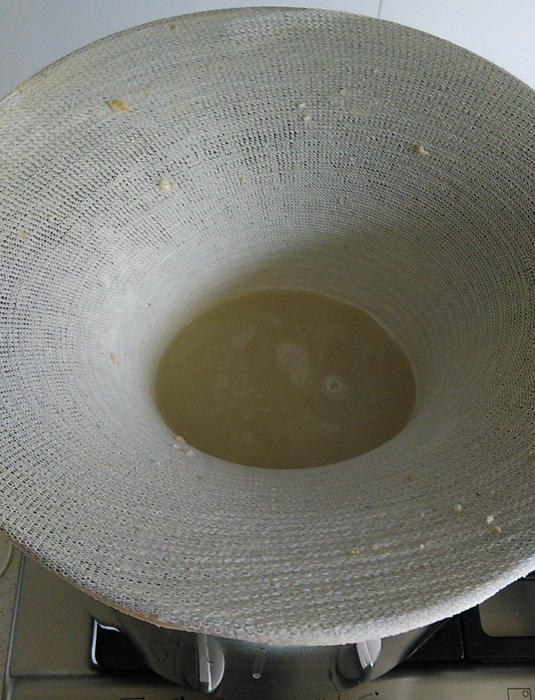 Next morning… krausen! The gravity sample had started fermenting with the yeast that was there. All I can do is estimate the gravity reading. 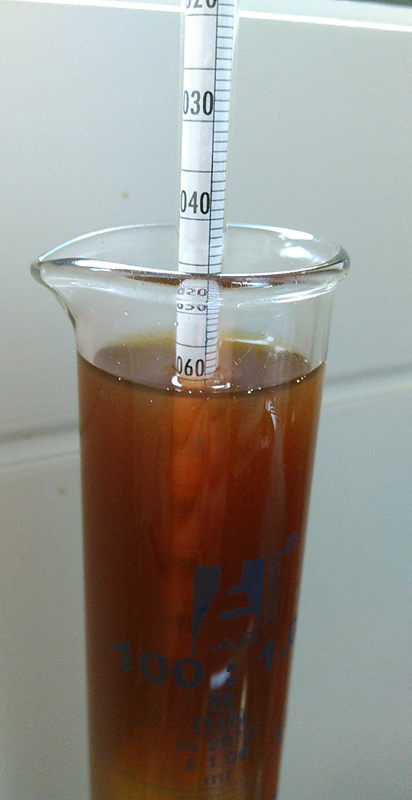 The photo looks like nearly 1.090, but I think that’s partly due to the krausen pushing it up. If I remember correctly from the day before, it was closer to 1.080. The recipe should have hit about 1.081 and I’ll go with that. Moral of the story? If your gravity sample has yeast in it, get a reading ASAP! Looking forward to trying the stout. It looks plenty dark and should be very think with all the starch in there. Might be a bit too much, but won’t know for quite some time. Not to worry, in a few weeks the Milk Porter should be ready. Yum. Did I really skip the grain steeping part to make an extract only oatmeal stout? Probably not. As I spent so much time on the oats I think you could say this really is a extract and grain recipe. Even if there were no malt/barley grains. But I’m happy with it. So good to be brewing again. Finally got around to brewing something I’ve been wanting to get down for a while. Plus, Chas was able to make it for another fun brew day. Sunday before last, the seventh, was a bottling day for the Lazy House Ale #1 and brew day for a porter I’ve been wanting to make for a while. With the new place there was a bit of getting-use-to the place, but the day ran smoothly. Getting the 11 litre boil going and grains steeping was priority. Chas got to cracking the grain while I sorted the water. 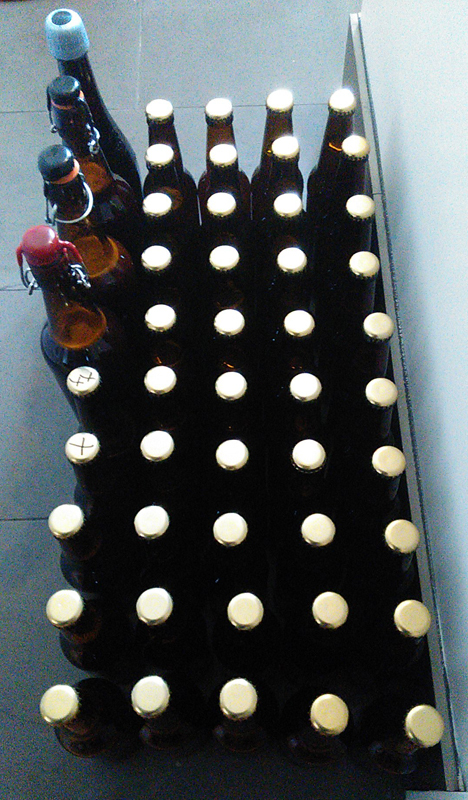 Once all set it was time to bulk prime and bottle the Lazy House Ale. Used 64 grams sugar dissolved in about 200 millilitres of hot water. Put this in the big fermenter and carefully racked the beer into it. Took a gravity reading and was surprised to see it hit 1.012, just as calculated. You might remember I didn’t get a proper original gravity so it might have been higher, or maybe I’ve finally got the hang of this home being thing. On a side note, no temperature control in this and it would have dropped below 10 degrees a few times. Bottling went without incident. After not too long there were 36 bottles filled and capped. Back to the porter, there was a bit of a rush. Lactose, maltodextrin and steeped grains were meant to go in with 10 minutes to go, but distractions meant they went in 5 minutes later. Oh well. I’m sure it shouldn’t make much difference. Flame out then last hops went in. Rather than start chilling straight away, like last time, the liquid malt went in. Then into the ice bath with an ice and water top up. After a good half an hour or so of cooling we poured into the fermenter and sived out the hops. Realized that not all the liquid malt dissolved. Lesson for next time. Then topped up with cold water to 18 litres. As the wort wasn’t cool enough yeast didn’t get pitched for a while. Wasn’t until next day that yeast went in. Nearly a whole pack of yeast, maybe half a teaspoon left. Was only a matter of hours before airlock started up. Always a good sign. The original gravity came in at a respectful 1.060. This should come down to high 1.020’s giving a solid 6% alcohol and plenty of body backing it up. The sample tasted really good and I’ve got high hopes. If everything goes well I might pitch another dark beer wort onto the yeast. Maybe a coffee porter or stout. Speaking of dark coffee beers, Chas brought around some bottles of his latest (4th) version of his coffee porter The Friedlieb. At 10.2% alcohol it’s a lot more like a stout. I’ll get a review up in the week or so. The Lazy House Ale sample tasted great. Not over the top with hops like I feared, which is good. First tasting will be this Thursday. Probably a bit too early. Will wait and see. Good to be back into brewing. Plenty to be excited about. Back brewing, finally. Last brew was in January and ran out over two months ago. After over 18 weeks, it was time to brew again. That’s exactly what I did a couple weeks ago on a quite Thursday night. I could rattle off the big list of reasons why I haven’t brewed for so long. But let me simply say: we started looking for our first home, bought a place, moved and settled in. Like all change it takes a bit to get use to. I was meant to dumped the liquid malt into the fermenter and the hot wort at the same time. But, by default, I started chilling the wort straight after the boil. As a result when I put the liquid malt in later it didn’t dissolve as intended. That meant I didn’t get a realistic gravity reading. 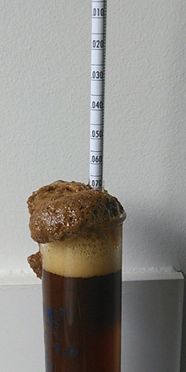 Original Gravity only came in at 1.022 but was calculated as 1.048. I’ll be using calculated OG for the purpose of calculating final alcohol, even though I rarely hit calculated OG. Add this was a bit of a finish-off-what-I-have-brew things were changing right up to brewing. 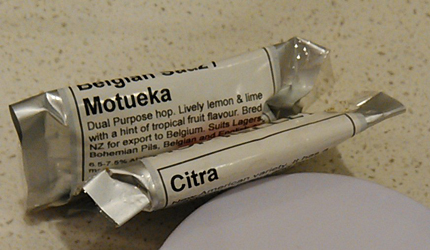 The amount of Citra hops was more than I would have liked. I thought I might get away with it… until I tasted the sample. A fair bit hoppier than I was aiming for. We’ll wait and see how it balances out. It’s been over two weeks since brew day. Going to bottle tomorrow. Then onto more brewing. A dark beer is needed so it can be aged and appreciated during winter. A two litre apple cider is required. The next “not-beer” really needs to be done. I’m going to be busy. There has been a slow down in content the last two months. Hasn’t been a brew day for all of February or March! I’m going to address that over the next two months. To start with I have a beer related, but not homebrew, piece for you all. Followers of We Make Homebrew will know that it has been Chas and I taking turns in writing up brew days, bottling days, reviews and other homebrew related pieces. 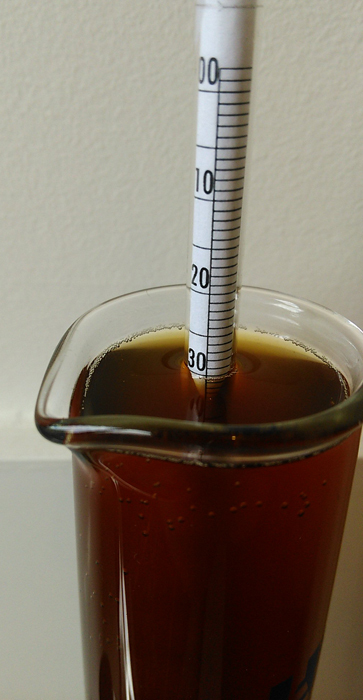 Chas has been very busy with another site Brew In Review over the past six months. If you haven’t checked it out, then I recommend doing so. Especially now, as I’ve finally finished my piece on my conversion beer. This piece is the story of how I came to becoming a bit of a beer lover, not just drinker. These pieces are about moving from someone who drinks beer, into someone who enjoys tasty (craft) beer. I hope you like my piece. And check out the other Conversion Beer stories as well as a bunch of the other content. Been a while between posts. Sorry. Very busy with everything not brew related. 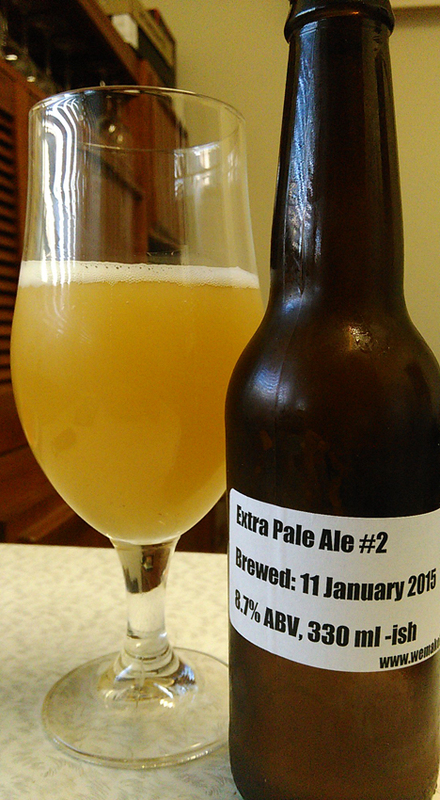 That said, here we are at the review for the Extra Pale Ale #2. It’s been over five weeks since this beer was bottled and absolutely ready for a tasting review. First thing to note is the look. Was very clear in the bottle before heading into the fridge. You can see from the photos it’s very cloudy. Not that look means much to me, but a lot more than I expected. Feels like it’s more pronounced that the Extra Pale Ale #1 cloudiness. Aroma on this is big in apples. Yep, that’s acetaldehyde giving that green apple smell, and some banana esters too. What caused that? High temperatures and poor yeast. Sure, this got piched onto reused yeast. And that should have eatten the sugars quickly. But, some bad quality control on keeping temperature down was the main factor here. These two characteristics of acetaldehyde and esters come out in the beer flavour as well. It’s a bit disappointing as they take over a from what would otherwise be a really good beer. Behind these flavours there’s a nice light malt flavour with plenty of body. Yep, that Malto Dextrin is working a treat! Will be using that a lot more. At 8.7% alcohol you would expect bite and harshness, not the case. The alcohol is hidden very well. Partyl with the big fruit flavours, but also the body. Have to say it again, the Malto Dextrin is a great addition to a strong pale ale. If you’re an extract home brewer and not using the stuff in your bigger alcohol beers I urge you to give it a go. The beer finishes with plenty of fruit. Sure the acetaldehyde and esters dominate, but the hops from the amarillo come out to say ‘hi’ and have some fun. Is it better than the Extra Pale Ale #1? Overall, no. But there’s elements that work better like body. Plus if feels a bit smoother. Food matching is hard. Probably something greasy like fried food or fish and chips. Yeah, that sound good. Could also be match with a burger or chicken parma. Next time use some US-05 yeast will be used, and ferment at a lower temperature. The good news is that Summer is finally over and brewing can be done without crazy chilling techniques. But that also means needing to get in front of the darker beers so they’re ready for the cooler months. Better get cracking! Back a couple weeks back I tried one of the Extra Pale Ale #1 beers. I was expecting it to be a bit rough, especially being 8%, using a chunk of sugar and using kit yeast. I was surprised with what I got, in a very good way. And now it’s time for a proper review. First thing to say is that I was hoping for something drinkable, and that was about it. Very cheap to make with half dry malt extract and half sugar. Plus only a touch of hops and some old kit yeast. What I was really trying to do is get something thin and dry to fill in the gap that my Summer Ale failed to do. There’s still an apple hint to the aroma that I got from bottling. Slight smell of yeast there as well. First taste is light with hint of apple sweet. That is from the yeast and drops off pretty quickly, which is good. Then the orange floral flavour from the Amarillo comes out. This is really nice here. While quite subtle, as not much is used, it still is clearly there with no much else going on. The orange flavour lingers on, especially once the beer has warmed up after coming out of the fridge. Through the beer there’s a bit of roundness to the flavour with that extending to the end. It’s almost butter-like, similar to a good Chardonnay wine (yeah, been tasting quite a few of those over the last couple months). Sure there’s not much body, you could go as far as saying nearly no body. But the finish isn’t a dry or harsh end. So you don’t feel like you need to go back for more straight away. And at 8% alcohol it is probably a very good thing. And that’s another point, the alcohol doesn’t come out in this beer which makes it that bit more easier to enjoy. Hard to say what to eat with this beer. It’s very light body with only a hint of orange and light sweetness. Good to have on a hot day with some snacks. Maybe a cheese board or dips. Keep it cold and have it by itself. Very happy with how this turned out. Looking forward to how the Extra Pale Ale #2 turns out. Then, next spring or summer make adjustments with hops and yeast for a better brew. 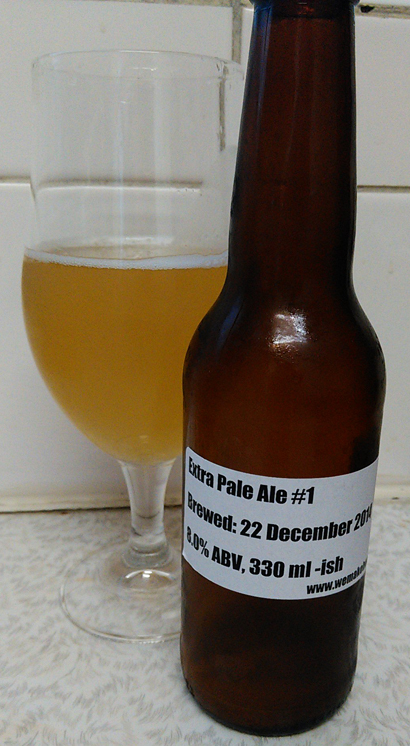 It has been just over five months since Pale Trial Zwei was brewed, back on 31 August last year. The review is long over due. So, here it is. A bit of a recap. Pale Trial Zwei was a follow on from Pale Trial Ein, one large batch split into five fermenters. Each fermenter had a different combination of yeast nutrient and with/without Campden tablet. For the Zwei batch this was pitched directly onto the yeast of the Ein batch after bottling. You can go back to the review and see that there was a wide range of flavours from the same original wort. There was some slight issues with the labelling and I’m not 100% sure if each of the batches, one to five, was recorded properly when bottled. Although there was an the ideas to do a comparison of the Ein beers to the Zwei beers, it isn’t possible. We just have to compare the Zwei beers against each other. Plenty of melon, lime and grass aroma to this. A promissing start to the first beer. Flavour starts off with a smooth/sweet melon taste. Then there’s some stone fruit and a touch of sweetness with the melon flavour coming out more. The beer finishes off with a smooth end. If the first one had some good mixture of melon, lime and grass then this one takes it a bit further with more of the grass aroma. The melon and lime flavours come out at the start with a slightly lighter melon and more lime than #1. Soft flavours in the middle then finishing of with some slight amber malt and a touch of lime flavour. Clear melon and lime aroma from the start and a hint of rust. The flavour starts with the melon and rust from amber malt. Then the amber rust malt flavour builds a bit. Finally there’s a bite with some melon and dry finish. Clearly this has more going on than the rest and is the better one for it. Aroma is a simple mixture of melon and rust. At the start there’s a melon and bitterness to this. Hints of rust amber malt comes in then the flavour drops off at the end. Lighter and simpler in flavour than the rest. Not a great start with a banana aroma to start with. Some mellow melon flavours fist up. Then banana flavours come in and build to the end. Also has a bitter and tart finish which is not nice. Was very impressed with these beers. Well, all but #5 and I think that might be infected, or something. The melon and lime elements from the Galaxy hops were the main players here. But interesting to see a rust amber flavour from the malt. Wasn’t expecting that and it was a pleasant surprise. For matching with food anything from simple fried fish to Vietnamese or Thai would work great. Anything with a bit of light spice or grease. If I was to rank these the worst is the easiest, #5. The top two are #2 with the most melon smoothness and #3 with the most complexity. The rest are a bit harder. After a bit of back and forth I came up with the following from first to last: #3, #2, #1, #4, #5. Was strange to see how these beers differed so much. Just like when I reviewed Pale Trial Ein, there was a lot of variation. And again, it highlights how little changes in something like yeast nutrient or a campden tablet can impact the final flavour on a beer. There’s plenty more to learn about brewing. And that’s pretty exciting.